The NXQ9000 is well-suited for high volume roll to roll applications for flexible materials or manual / auto load of large area panels or substrates. With the ability to do either 1x full field exposures up to 320mm square, or step and repeat quadrant alignment and exposures by recipe selection, the user can optimize the print modes for specific process requirements. The system can be configured for larger area rolls, panels, or substrates; please contact us to discuss. Step and repeat mode for controlling run-out and CD variations possible with 1x large area aligners and 1x full field projection systems, or use full field exposures to increase T-put for larger feature sizes. 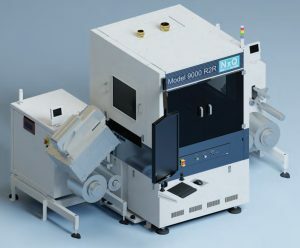 The NXQ9000 fills a market void for an affordable large area photolithography system for feature sizes 2um and larger. Many large area photolithography systems are based on expensive projection technology and do not meet the ROI criteria of many emerging markets that require low Cost of Ownership to make the technology financially viable. The NXQ9000 is priced at 50-80% less than 1x full field projection systems and 1x or reduction steppers in the marketplace. Target Markets include wafer level packaging, interposer, sensors, display, product security / anti-counterfeiting, RFID, solar, Medical and wearable electronics. We welcome the opportunity to discuss your applications and to learning how we may help you by providing a superior cost-effective solution. Read the overview of our large area photolithography system.